Before anime, before D&D, and before everything else in the nerd-o-sphere, I was a fan of science fiction. Especially novels from the golden age of sci-fi. My first was Heinlein’s Rocket Ship Galileo and from there I fell in love with the idea of using futuristic concepts to explain and discuss the human condition. And of course as a little kid I was in a golden age of robot shows in the 80s, fed a steady diet of Transformers, Robotech and Voltron. So when I got older and these two great tastes got mooshed together I was on board. From Armored Trooper Votoms to The Big O I liked that giant robot shows had more than sweet fights, they were set pieces to figure out the old meaning of us. 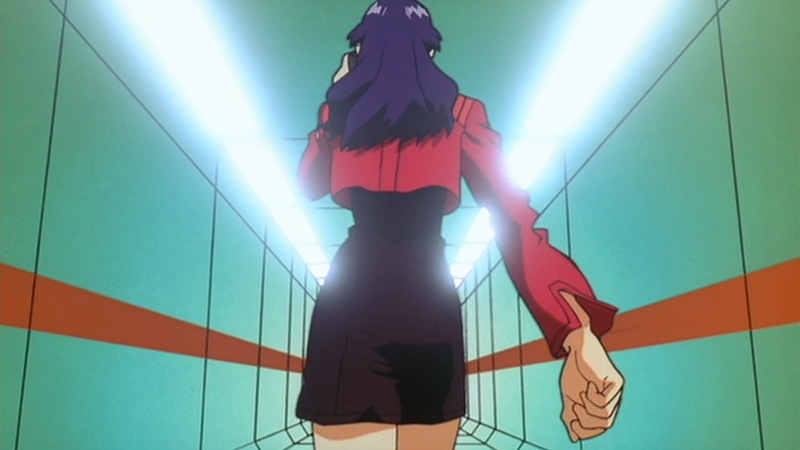 While sometimes I think that fell flat (I’ll hold my thoughts on Neon Genesis Evangelion out of this) on the whole mech anime has been a solid balance of good fun powerful fights and some hard sci-fi. 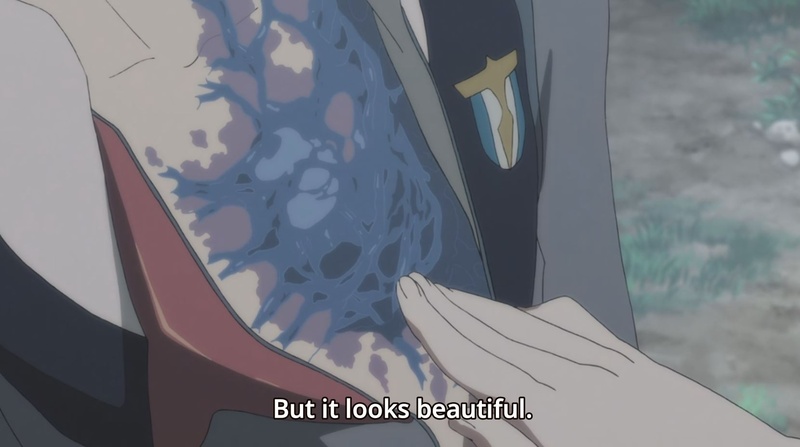 When it comes to Darling in the Franxx both sides of this equation feel unfinished. On the side of sci-fi we have this very alien world where we force our children to become soldiers on the front lines piloting mecha to stave off humanity’s destruction from these odd huge entities called Klaxosaurs. Humanity exists in these roving futuristic city-states known as Plantations and are powered by the heat of earth’s magma. 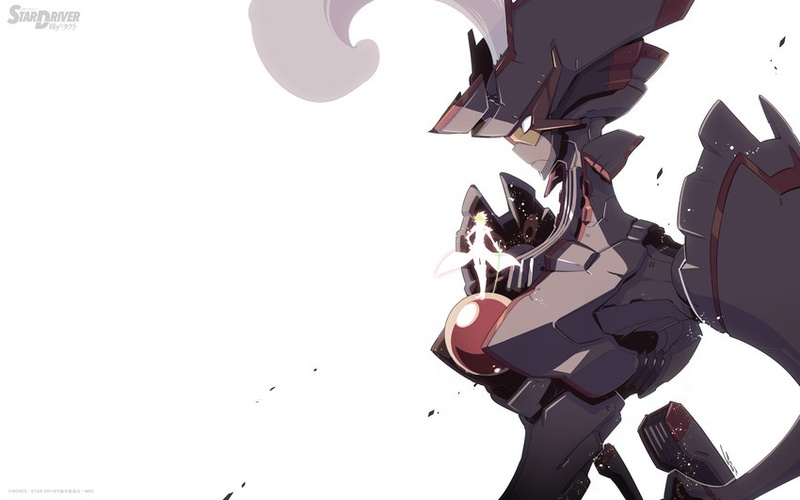 Klaxosaurs can only be destroyed by precision usage of magma powered weapons wielded by the Franxx, and the Franxx are such complicated mechs they need two users called “parasites” who are completely in tune mentally with one another in male and female pairings. These pairings are scrutinized through adolescence and puberty to find those who can reliably pilot these machines. It gives a rise to a lot of interesting questions about how this society functions, what happened to the earth to make it such a desolate wasteland, why is society focused on keeping aspects of sexuality away from the youth if they, in essence, need it to defend themselves? Well these WOULD be interesting questions if the characters could focus on them for more than a few scant minutes every 3rd or 4th episode. On the side of mechs I have to wonder, why even make this a mech anime at all? 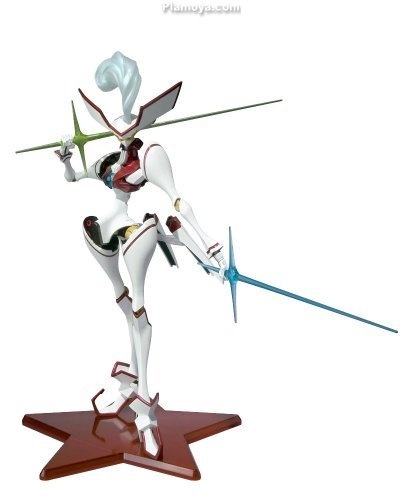 The designs are purely what you imagine when you think “modern magical girl”. In the last episode you even have a magical girls-style transformation ripped right from one of Trigger’s previous works, Kill la Kill. The main characters we’re rooting for have such janky and weird designs it really looks out of place. 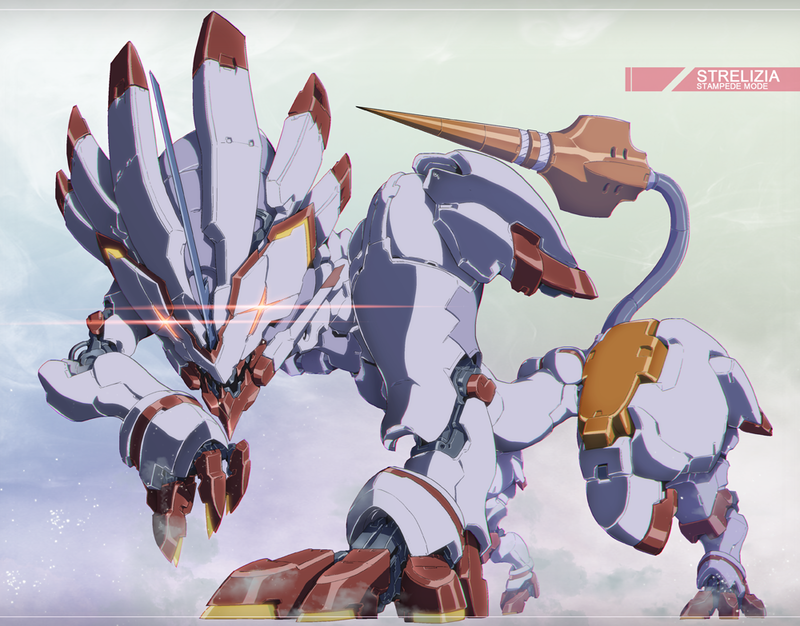 The generic style mechs look a lot more interesting to me and fitting while Strelizia, our main character’s mech, has a much cooler alternate mode we only see twice. 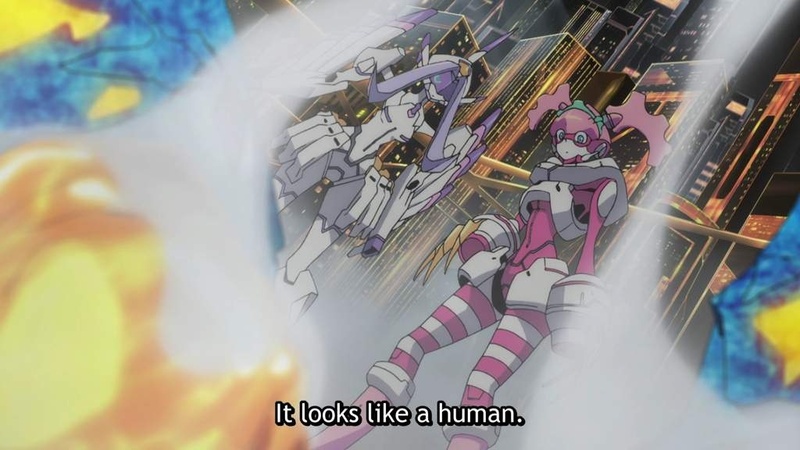 It transforms into a mech beast…before it’s “powered up” like a magical girl. 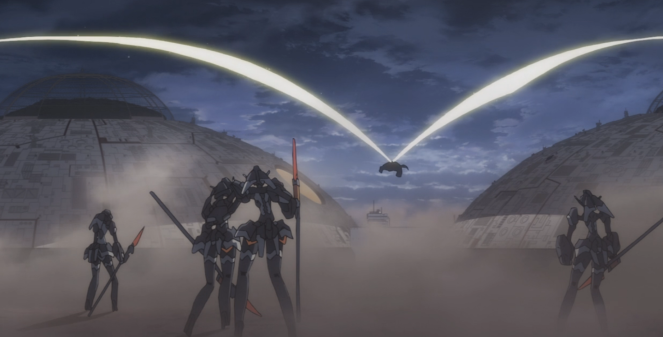 And I could forgive all this if you made your mech anime have pretty consistent mech battles. There are episodes where we spend barely any time fighting Klaxosaurs, and a few where we don’t even get a fight at all. So what does that leave us? The characters, their interactions, the sheer force of their quirks and personalities and lots and lots of ham fisted sexual tension through the eyes of kids who have grown up in a society that, for lack of a better phrase, doesn’t “do it” anymore. These mechs are powered by liquid hot magma but their abilities are determined by sexual compatibility and it is in this rich stew we are introduced to bland protagonist main character: Code 16 AKA Hiro. 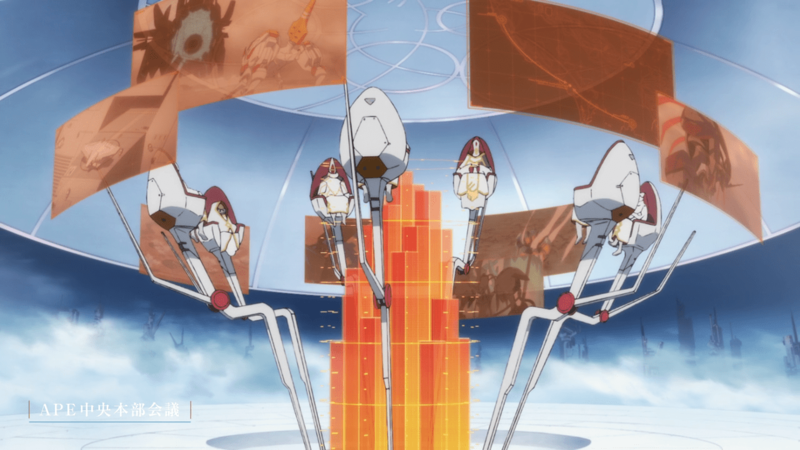 In the future they depersonalize their children into nothing more than a number based on ability to get a Franxx working. Many of our cast of characters are lower numbers, but there’s something about Hiro. He had all this potential and then it just drained away. 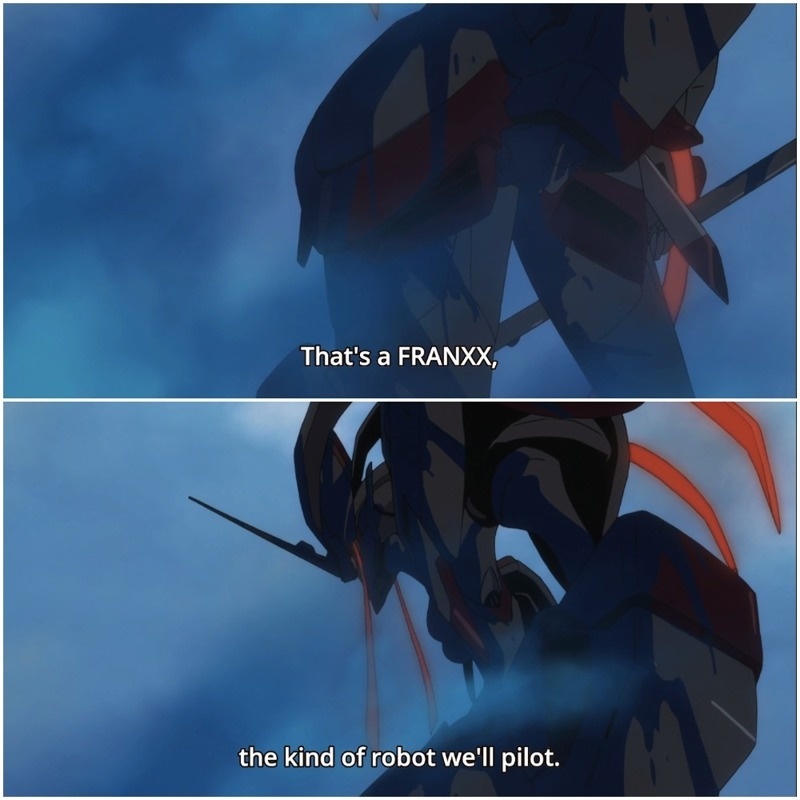 As we meet him he is about to be drummed out of the only reason he felt he existed, to be a Franxx pilot. 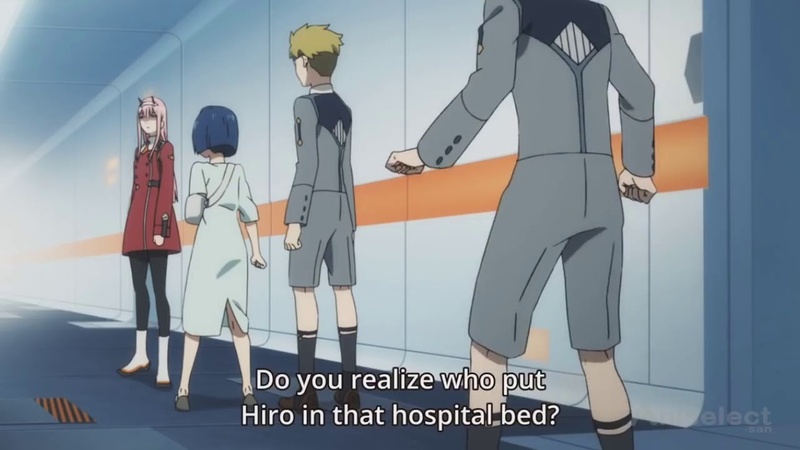 His fellow Parasites, some good childhood friends, are supportive, worried but are just as excited with zeal to be Franxx pilots. But soon he meets a girl having a quick skinny dip near his home, a girl with horns known as Zero Two. 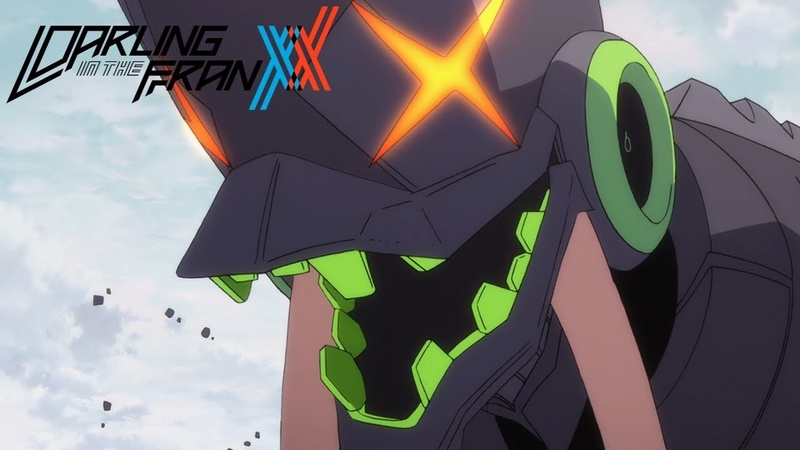 A straight up disaster of a girl who seems to rebel at everything but lives to destroy Klaxosaurs, can pilot a Franxx by herself but those who team up with her die after the third use. But through fate and happenstance Hiro and Zero Two are compatible as all get out and she finally releases his true potential, while he reigns her into reality before she destroys herself. I shall now proceed to pleasure myself with this fish. They wrap this up in about six episodes which leaves us with probably 18 more to fill with possibly some of the worst “problem of the week” shennanigans I’ve ever seen. 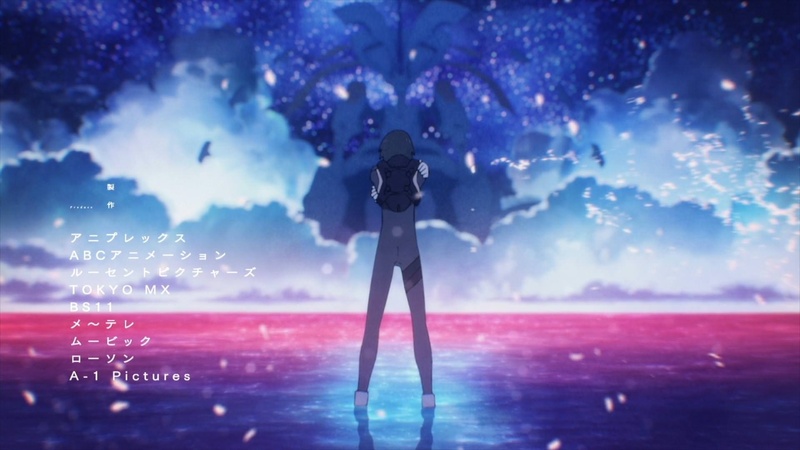 Episode seven is the beach episode where all we learn is how ignorant they keep the kids of the Franxx project. Episode eight has a short mech battle in the beginning, but dovetails right into a “We’ve divided the house in two” sit-com situation. For a few episodes it looks like we could get more mech battles and actual conflict but it sends us straight back to Hiro and Zero Two having to find compatibility again. That was our first arc already, finding compatibility… The whole “Bird with one wing” speech that gets hammered over and over again. The series isn’t over as of this writing, as episode 16 released three days ago, but they have time to dip in that well again, oh yes. Pfft! Look at their shorts and long sleeves with sock garters exposed! I may not like the mechs but the boys’ uniform design is worse. So what about the animation? Honestly it’s alright. 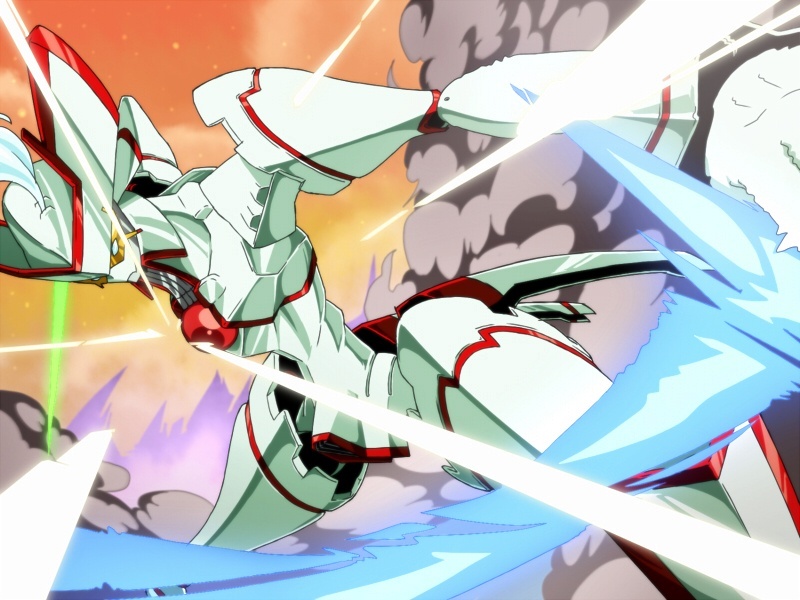 I like studio Trigger’s style even if I don’t like every anime they do. 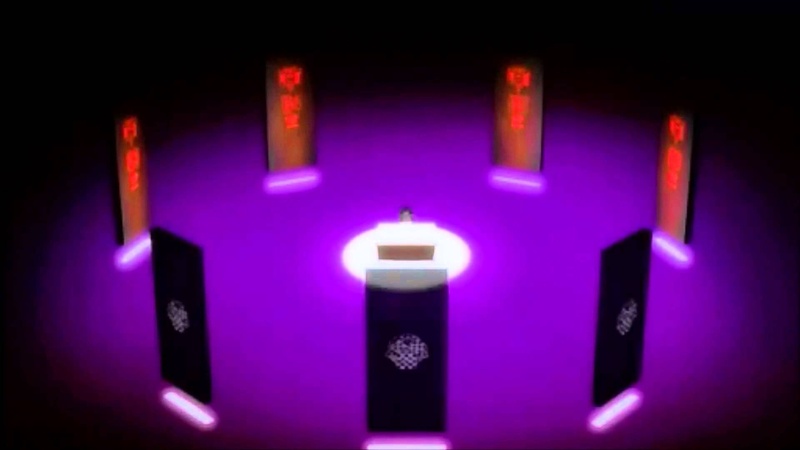 The voice acting is serviceable and I tell you, were I the target audience age the VAs of Zero Two do a very good job of being interchangeably mysteriously bored, slyly perverted and excited to get to action. Both the opening and closings are rather weak for what is the most talked about show of the season, but with this many memes churning out over the internet do you really need them to be strong? You don’t need a hook when you’ve got waifu to bait the trap. There may be an addendum after the series is over. Who knows, this may be a kind of yin/yang series that will truly form it’s own as a whole rather than it’s rising and middle acts. But for now let’s give the verdict. 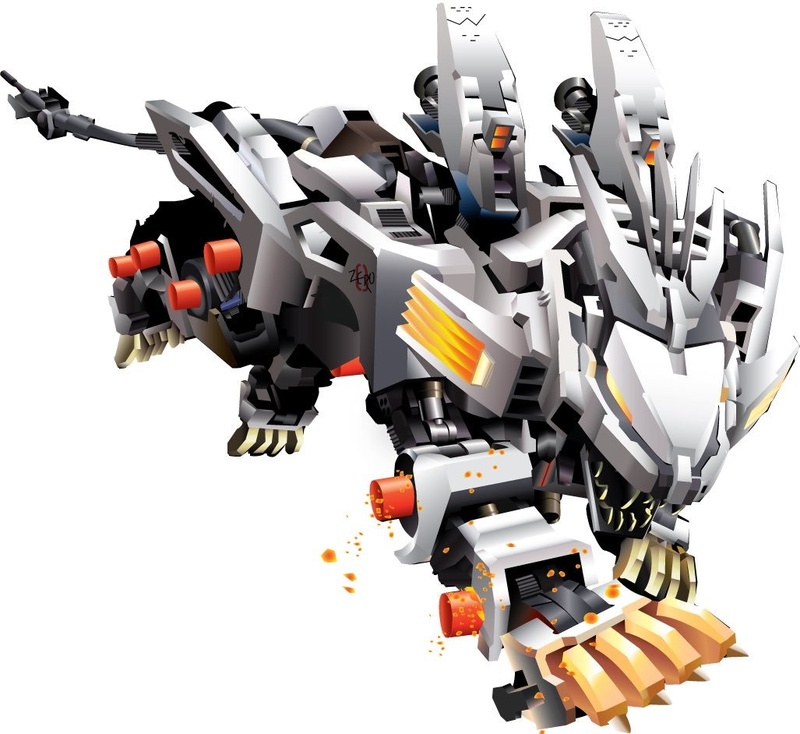 – I like how the Klaxosaurs look, not innovative (they are bargin basement NGE “Angels”) but they’re neat to look at. 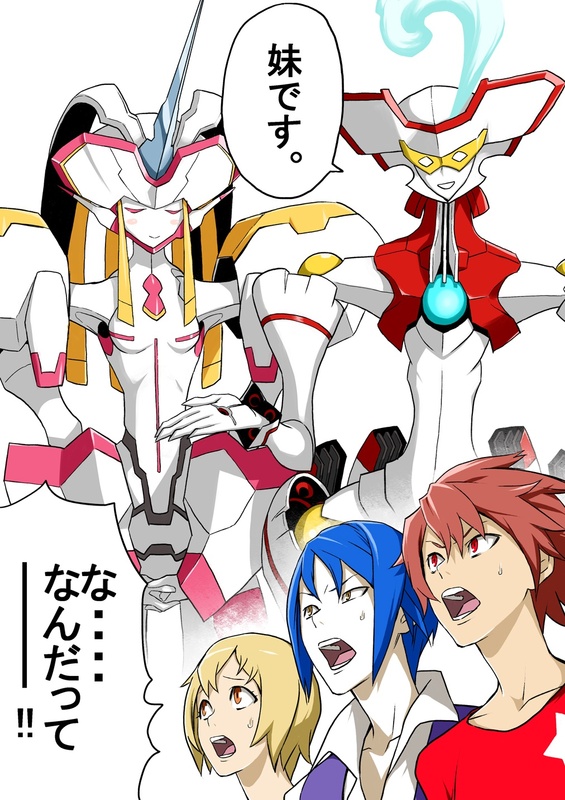 – Apart from Zero Two everyone is just so generically bland character-wise. May be an artistic choice… but a terrible one. – For a mech anime there is a lot of down time before we get back in the robots after a sortie. – Those interesting “kernels” are going to either have unsatisfying or no payoff whatsoever. 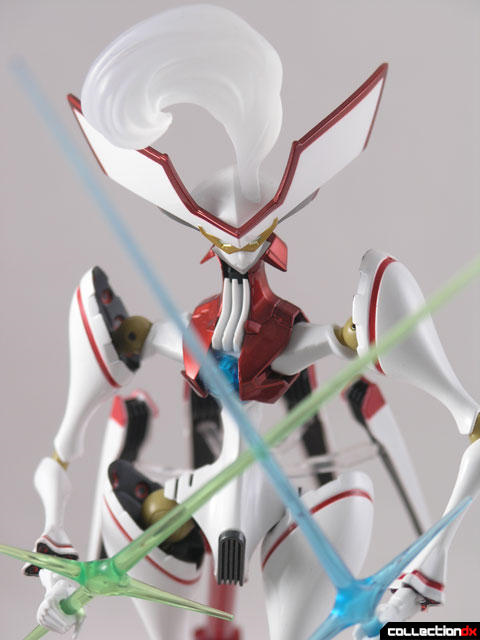 while this is just a personal gripe, they very blatantly ripped of Strelizia’s design from another mech anime.